Parks are frequented for pleasure, refuge, and solace. They are found in the most affluent suburbs as well as the harshest urban settings. Designed as neutral territory, parks not only offer a patch of green, trees, and benches, but are a barometer of the community in which they are found. The photographs focus on the people who frequented Tompkins Square Park—a ten-and-a-half-acre plot, laid out in the early 1830s, named after then vice-president Daniel P. Tompkins. Located in New York City’s Lower East Side, it is an area that became home to the Irish, Germans, Jews, Italians, Slavs, Poles, Ukrainians, Hispanics, and African-Americans, in successive waves of immigration. Each group that settled in the neighborhood used its grounds for protest. The photographs were made during daily half-hour strolls, beginning in August 1997, and ending in August 1999. In this two-year period, Tompkins Park was used by the general public, but also provided asylum to a variety of indigent people, including runaway teens, the mentally ill, parolees, prostitutes, substance-abusers, vagabonds, and the homeless. This distinct and diverse human family offers an unsanitized view of life—a humanity composed of the sacred and the profane, coexisting on common ground. We encounter a troubled teen, a neo-Nazi, a senior citizen feeding pigeons, an assortment of lovers, an exhibitionist, a man meditating, volunteers with food for the hungry, a battered woman, a dancer stretching his body—each a unique universe. I pointed my lens on those who consented, and gave them prints on subsequent days. Authentic photographs are rooted in the trust established between photographer and subject. The resulting images are freely given, and, as such, affirm life, no matter how dire or bizarre the circumstances. This cast of “characters” has long since vanished, due to the efforts of former mayor Rudolph Giuliani, who successfully rid parks of their indigent population. Today, boutiques, restaurants, and developers have made their imprint on a run-down neighborhood seeking a face-lift. These images preserve the face of a colorful heterogeneous community, and mirror a unique period in the park’s history, a time when the tender and the savage found harbor on public soil. We are all one body. 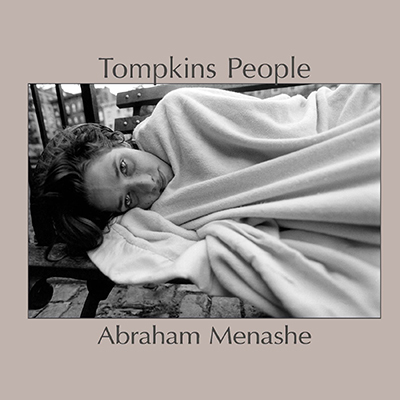 With these photographs, I embrace Tompkins People, and present them to a wider audience, so that everyone may see in their eyes, our children, our neighbors, ourselves. Tompkins People, Abraham Menashe, available from iTunes. ←Older: How do you define Beauty?